Friar, Juan de Padilla, who wrote a dairy, accompanied Coronado. Coronado stood, where the Santa Fe Trail passed and the soldiers of Fort Dodge kept watch. promptly claimed the land for France. 1700 Regardless of the claims of other nations, in the mid-1700s and very early 1800s, Kansas was still a wide-open Indian territory, and a land of great potential. When the U.S. Purchased Kansas from France in 1803, as part of the Louisiana Purchase, thousands of settlers from the east began flowing across this land. defined tracks along the entire route of the trail, is easy to reach. 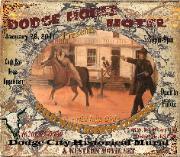 It is nine miles west of Dodge City on US 50 -- watch for the "Historic Marker" signs. The Sunflower is the Kansas state flower and it was domesticated for food production by the Native Americans. which led to many calling the plant "soap weed" rather than its botanical name, yucca. with its distinctive black "V". on the end of its tail acquired from the regular shedding of the skin. 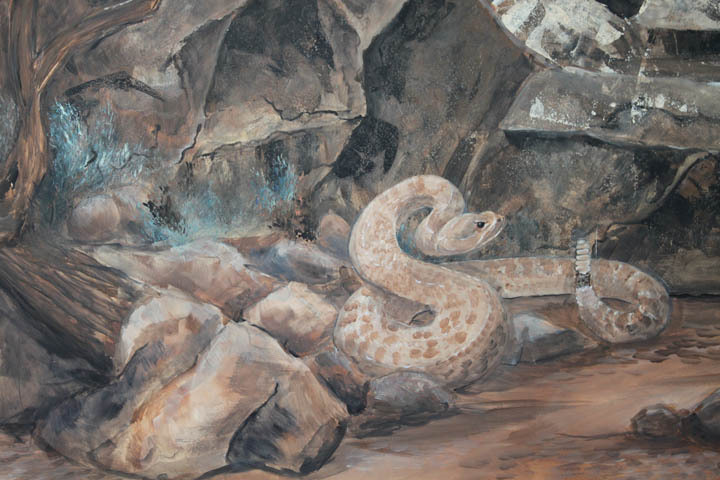 When the rattlesnake is alarmed, it responds by shaking the rattles on the end of its tail. Dodge on the edge of the military reservation, with the Sitler's home as the first building. 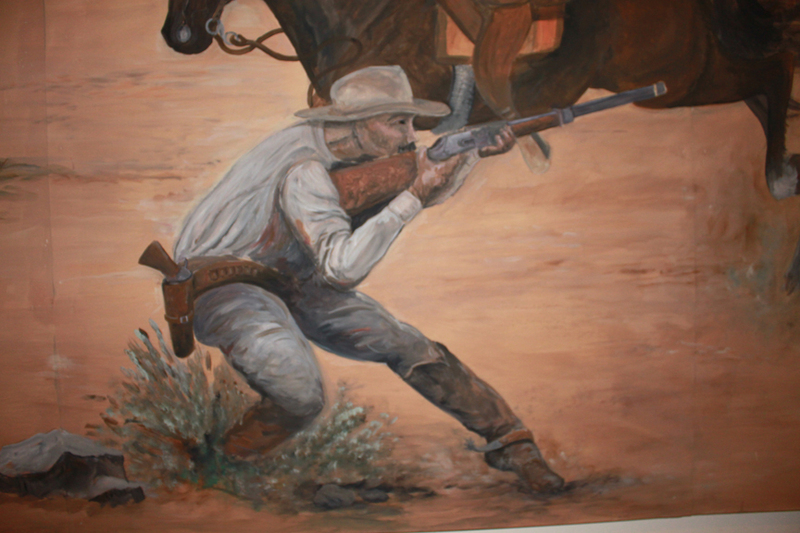 It quickly became a trade center for travelers and Buffalo hunters. Atkinson on the old Fort Mann site..
Texas longhorns from the heavily settled, eastern portion of the state. Longhorn cattle north to the railroads of Kansas for shipment to Northeast markets. 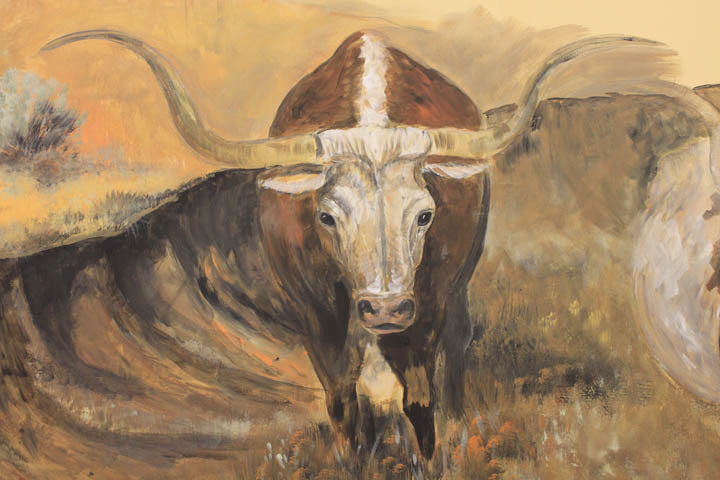 Between the years of 1875 and 1885 over 2.5 million longhorns were trailed into Dodge City. 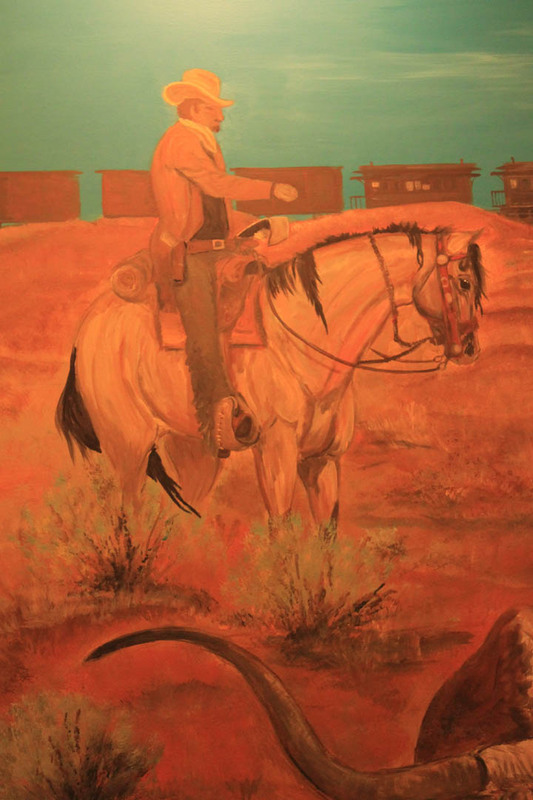 Although the era only lasted 10 years, Dodge City became forever a part of the American spirit. 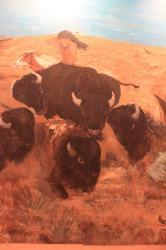 was abundant including vast herds of Buffalo. ordered 2,000hides at $3.50 each. The boom was on and hunters flooded the plains. A good hunter could make more than $100 a day. building. 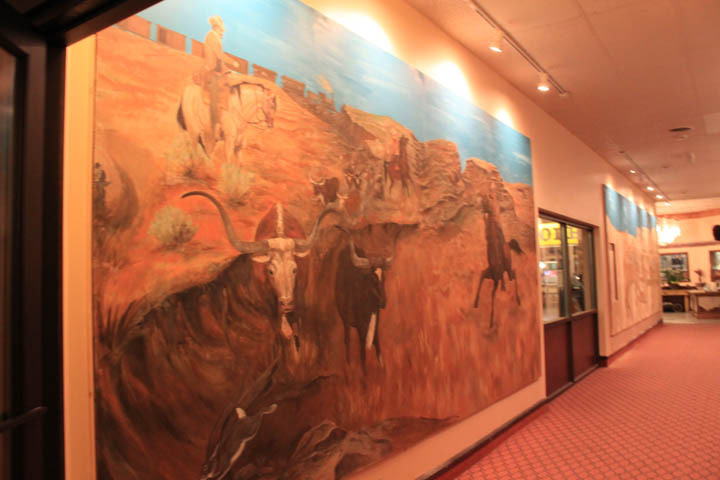 It quickly became a trade center for travelers and Buffalo hunters. used in the manufacture of china and fertilizer. driven from Texas to Dodge for about 75¢. 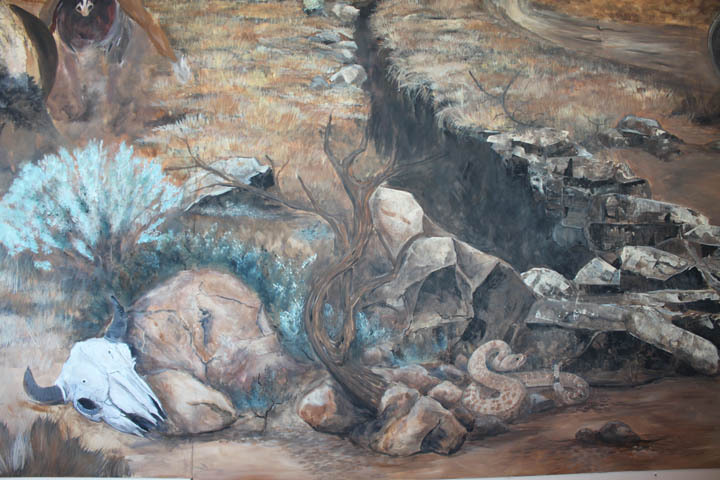 1875 In this part of the mural you will see how dodge was in its hay day. Dodge City- know as the ‘Wicked Little Town” Showing the famous men of it’s time. drinks. Ice was usually available, so even beer could be served cold. Some saloons advertised anchovies and Russian caviar on their cold lunch menus. houses, dance halls and saloons catered to the Texas trade. Saloon keepers renamed their places, Alamo and Lone Star and served brandies, liqueurs and the latest mixed drinks. piece orchestra. Beeson also organized and led the famous Cowboy Band which entertained all over the west at cattlemen's conventions, concerts, dances and in Washington, D.
C. at the inauguration of President Harrison. 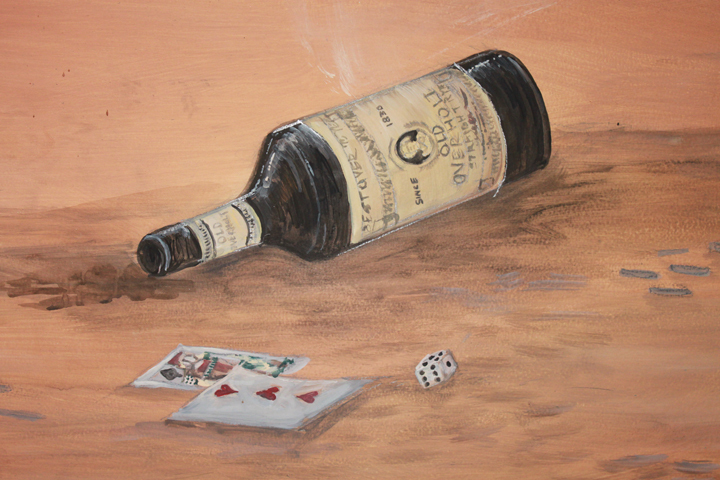 friendship between Wyatt and Doc was strange, Wyatt ignored them and Doc kept the law while in Dodge City. seeds and pods were ground into flour; leaves and roots were used as a medicinal tea; and a frothy soap was made from the roots which led to many calling the plant "soap weed"
rather than its botanical name, yucca. see how dodge city was in its hay day. Showing the famous men of its time. carried north of the “deadline” which was the railroad tracks.